Formally less vigorous, Force Majeure is a departure for Östlund. Gone are the static long takes and distant wideshots, ala Roy Andersson style, it only focuses on one family and their immediate contacts in a luxurious ski resort up in the Alps. A well to do Swedish family, headed by handsome, Clark Kent jawed dad Tomas (Johannes Bah Kuhnke), mommy Ebba (Lisa Loven Kongsli) and two young blonde kids, is a picture perfect white family straight out of a Banana Republic catalog. The massive resort and ski area is well kept to a tee by daily ground maintenance and subject to 'controlled avalanches' (I'm guessing, to make snow fresh for skiers). On day two of their ski trip, a controlled avalanche comes down to where Thomas and his perfect family are having breakfast on the balcony. In blinding panic, Tomas flees the scene, leaving horrified family behind. But it turns out that the avalanche didn't reach where they were, just blowing some snow over them. It was no big deal. Tomas comes back, as if nothing has happened. But for his family, their inner peace is shattered, forever. Östlund takes a crack at that concept of impenetrable masculinity. 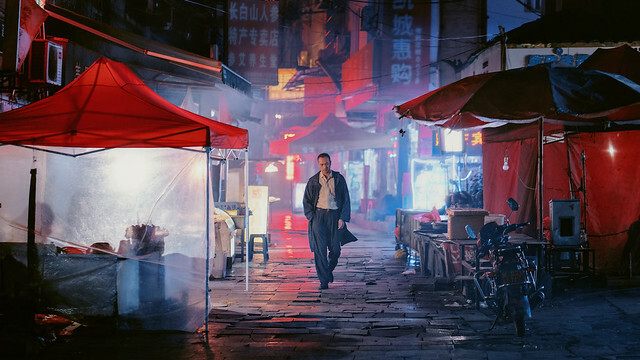 Tomas wouldn't admit the fact that he ran away- it's too unmanly to man up and admit his mistakes, and Ebba can't let go the fact that he is a sort of person who'd leave his family behind in time of disasters. If Julia Loktev's The Loneliest Planet examines the male's cowardliness on an individual scale, Force Majeure gives it a societal/familial context. The incident and subsequent talk gives Tomas's divorced friend (Kristofer Hivju) who is on the trip with a 20 year old girlfriend, a pause. Up in the mountains, the only choice to vent, for these scrubby and bearded manly men, is to scream from the top of the mountain (and risk another avalanche) or do a stag night with bunch of shirtless meatheads: drink, vomit while yelling at each other/at anything and repeat. The question is, how does Tomas reclaim and show his family that assurance? Do we keep going with 'Daddy Knows Best' tradition, or go with 'Daddy Doesn't Always Know'? Do we admit that we are all scared shitless child inside, despite our manly exterior? Östlund seems ambivalent about the answer. 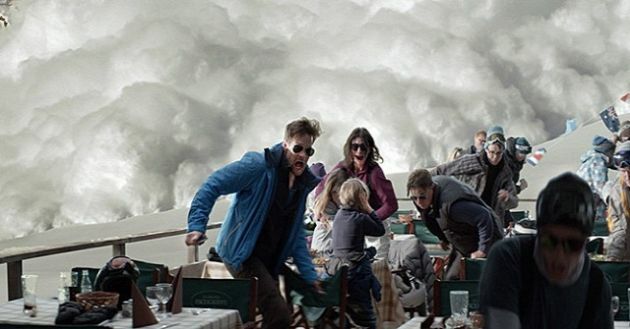 Not that his other films are laugh out loud comedies, but I found Force Majeure more disturbing than funny.